Firstly, it offsets the carbon emissions of a holidaymakers flight and car usage on a return trip to Spain. This is done by the planting of one tree for each person that is entered on our booking form, irrespective of age. Each tree absorbing 0.71 tons of CO2 in its lifetime that is considerably more than the CO2 emitted for a return flight and car usage. (see examples of CO2 absorption, below, from the CarbonNeutral Company). Secondly, the programme that is run by the not for profit organisation TFTF, allows for the planting of the trees in the developing world, bringing benefits to the local community in the form of food supply, fodder and fuel supply, as well as land stability and fertiliser. You will find a clickometer on the top right corner of each web page, which simply shows the number of trees that have been planted and links you to further information about the programme. If you have not booked with us then you can still register and we will Plant a Tree for Free for you anyway. Registering, below, will also allow you to be entered into our regular Free Prize Draw, when you opt to receive our periodic newsletter. Tick the opt in button and a periodic newsletter (monthly) is sent out that serves to be informative about aspects of the area and our villas, for which you can opt out of at anytime. * Registration automatically then helps communities, in the developing world, with our Plant a Tree for Free programme. * Regular automatic entry to our Free Prize Draws, which includes accommodation, when you opt to receive our email newsletter. Should you choose to book a villa with us then we will plant a tree for each and every holidaymaker on the booking form. This planting programme is designed to compensate for all the CO2 carbon emissions that will be expended from the combined travelling incurred by all members in your party. It therefore includes the return flights and car hire usage during the entire holiday vacation (including children and babies). This is at no cost whatsoever to you, or your fellow travellers. Whilst at Villaspain we do not sell flights or car hire, though do have links to both on our website to help facilitate the making-up of your independent package at the most reasonable rates, do wish to help restore the balance of CO2, and at the same time assist with the associated programmes of tree planting in developing countries. Car hire 300 miles (based on a 4 door 2 ltr petrol car, with 2 sharing) = 0.05 tons of CO2. A single person will therefore contribute approximately 0.50 (½) ton of CO2 in total for the transport involved for their return flight and car hire usage within Spain. A single tree will absorb approximately 0.71 tons of CO2 over its lifetime, so our programme will more than compensate for the ½ ton of CO2 each person will expend when travelling. Click here for more info on how tree help the planet. Simply book any villa at anytime and complete our booking form in the normal way. We will then automatically allocate a tree for every person (including each child and baby) included on the booking form (see clickmeter which records the allocation on top of the homepage and above). In most cases the trees will have been planted by the time you fly, since the allocation and expenditure occurs at the time of booking and not your flight departure date. Planting of the one-year-old healthy saplings is conducted independently by an accredited non profit-making tree-planting charity specialising in agroforestry throughout the developing world, where it is most needed in bringing social and economic benefits to the local communities. These trees used in agroforestry and reforestation techniques will help to restore the natural resources of rural farmers' degraded lands. The fast-growing trees will offer the farmer food, fodder and fuel, as well as land stability and fertilizer. Updates to our website will occur periodically. The click meter above shows how many trees we have committed to buy, which increases on every booking. In August 2007, Cameroon Program Coordinator, Corrie Mauldin, went to evaluate the Cameroon Program and give hands-on technical training to NGOs in the Southwest, West and Northwest Provinces. Our training team included Mr. Nkembi, TFTF Cameroon Field Representative and Director of the Environment and Rural Development Foundation (ERuDeF), Robin Achah, ERuDef botanist, and Ms. Mauldin. Our team conducted workshops with 145 farmers and 30 agricultural/ environmental/ rural development NGOs interested in tree-planting. This is a program in the Province of Zambales, about 200 km. north of Manila along the south China Sea. The town where the program is centered is Botolan and the village there, where your trees are bring planted is called Maguisguis. It has a population of about 220 families. All of the people there and in the surrounding area were evacuated in 1992 with the eruption of Mt. Pinatubo and they are gradually returning and trying to restore their way of life. VillaSpain have been asked by TFTF to help them develop a sustainable livelihood which would include returning tree cover and eventually forests to the now-barren lands. TFTF are helping them plant multi-purpose, fast-growing trees to protect and restore the soils and build the water-retention capability of the land. With that we are incorporating fruit trees and also cashew, which is growing extremely fast in those uplands. Among the fruit trees we are trying to bring back a local species, locally called "duhat" which has a small, dark red and very sour fruit. It has been considered endangered since the volcano erupted. The rains have begun in the areas where our projects are located in the Philippines. This is a great relief following five months of severe droughts, as a result of El Niño. During this time, members of our partnering organization TREES Philippines worked hard to keep seedlings in the nurseries, and those already out-planted, watered. People also worked hard to build firebreaks, as many wildfires threatened their planting sites. Now that the rains have arrived, many members of TREES Philippines have created their own nurseries in order to increase the number of trees we will be able to plant this season. The problems with flooding that severely affected regions of Zambales province last year have opened villagers’ eyes to see how unable the denuded hillsides are of holding water. This has promoted a movement in several towns to create organizations of volunteers to plant trees both to alleviate the immediate threats of flooding and landslides, but also to help solve a growing concern amongst many Filipinos which is climate change. This concern is seen with changing weather patterns affecting agriculture production, and with the Philippines being an archipelago of more than 7,000 islands, rising sea levels, and decreases in marine life, which are very evident. Environmentally friendly activities are happening all over the Philippines, and now the military, political figures and even celebrities are “going green.” This has created a youth culture that is more aware of the many environmental problems, and is now doing something about it. In our projects many schools are joining in to learn more about how Trees for the Future is helping people to plant trees and the many benefits that trees provide to not only the people and the land, but to the earth as a whole. Local high schools and universities are assisting us with germination tests and space to create nurseries. Students gain a vested interest and assist with the out-planting and maintenance of the seedlings in the field. On August 2nd, a new batch of students came to the newly created training center in Loobunga to do research. They later assisted us to plant seedlings from two nurseries at the adjoining out-planting site. We plan to plant at least 200,000 seedlings of various species which they recommended based on their success with them in the past (growth and survival rates), and income generating potential (fruit and nut species). As this article is being written, Southeast Asia coordinator, Francis Deppner, is preparing to return to the Philippines to meet with four new groups interested in working with Trees for the Future to start reforestation and agroforestry projects in their respective areas, as they have heard how successful our current projects are. Trees for the Future was again chosen as the main beneficiary of the Global Mala, Philippines, an annual yoga event. Last year’s event was a success and proceeds from the event were able to assist us in the planting of 50,000 multi-purpose fast-growing trees on degraded lands in the Philippines. We hope that this year, we will be able to plant thousands more! 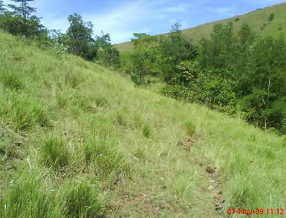 Before and after: The steep hillsides of Zambales covered only lightly with cogan grass don't allow the heavy rains to soak in. 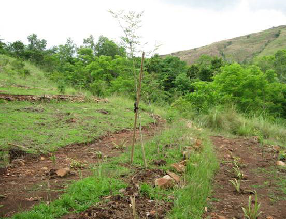 Tree projects follow the contour lines, allowing the rains to replenish groundwater aquifers.